Paxton Mob march on Philadelphia, published 1764. The Paxton Boys were frontiersman of Scots-Irish origin from along the Susquehanna River in central Pennsylvania who formed a vigilante group to retaliate in 1763 against local American Indians in the aftermath of the French and Indian War and Pontiac's War. They are widely known for murdering 20 Susquehannock in events collectively called the Conestoga Massacre. Following attacks on the Conestoga, in January 1764 about 250 Paxton Boys marched to Philadelphia to present their grievances to the legislature. Met by leaders in Germantown, they agreed to disperse on the promise by Benjamin Franklin that their issues would be considered. 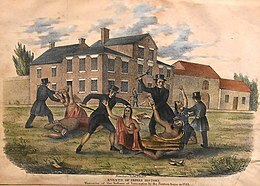 1841 lithograph of the Paxton Boys' massacre of the Indians at Lancaster, Pennsylvania in 1763. Although there had been no Indian attacks in the area, the Paxton Boys claimed that the Conestoga secretly provided aid and intelligence to the hostiles. At daybreak on December 14, 1763, a vigilante group of the Scots-Irish frontiersmen attacked Conestoga homes at Conestoga Town (near present-day Millersville), murdered six, and burned their cabins. The colonial government held an inquest and determined that the killings were murder. The new governor, John Penn offered a reward for capture of the Paxton Boys. Penn placed the remaining sixteen Conestoga in protective custody in Lancaster but the Paxton Boys broke in on December 27, 1763. They killed, scalped and dismembered six adults and eight children. The government of Pennsylvania offered a new reward after this second attack, this time $600, for the capture of anyone involved. The attackers were never identified. I saw a number of people running down the street towards the gaol, which enticed me and other lads to follow them. At about sixty or eighty yards from the gaol, we met from twenty-five to thirty men, well mounted on horses, and with rifles, tomahawks, and scalping knives, equipped for murder. I ran into the prison yard, and there, O what a horrid sight presented itself to my view!- Near the back door of the prison, lay an old Indian and his women, particularly well known and esteemed by the people of the town, on account of his placid and friendly conduct. His name was Will Sock; across him and his Native women lay two children, of about the age of three years, whose heads were split with the tomahawk, and their scalps all taken off. Towards the middle of the gaol yard, along the west side of the wall, lay a stout Indian, whom I particularly noticed to have been shot in the breast, his legs were chopped with the tomahawk, his hands cut off, and finally a rifle ball discharged in his mouth; so that his head was blown to atoms, and the brains were splashed against, and yet hanging to the wall, for three or four feet around. This man's hands and feet had also been chopped off with a tomahawk. In this manner lay the whole of them, men, women and children, spread about the prison yard: shot-scalped-hacked-and cut to pieces. In January 1764, the Paxton Boys marched toward Philadelphia with about 250 men to challenge the government for failing to protect them. Benjamin Franklin led a group of civic leaders to meet them in Germantown, then a separate settlement northwest of the city, and hear their grievances. After the leaders agreed to read the men's pamphlet of issues before the colonial legislature, the mob agreed to disperse. Lazarus Stewart, a former leader of the Paxton Boys, was killed by Iroquois warriors in the Wyoming Massacre in 1778 during the American Revolutionary War. In the Wyoming Valley event, one of three famous massacres during many scattered Tory-Amerindian staged attacks on colonial settlements that year in Connecticut, New York and Pennsylvania, Mohawk chief Joseph Brant led a group of Loyalists, Mohawk and other warriors against rebel colonial settlers in the area along the North Branch Susquehanna River. The raids resulted in the Sullivan Expedition the next year which effectively broke the power of the Six Nations of the Iroquois below Canada; and forced the British Colonial powers in Canada to shelter the Amerindians they'd incited into the attacks. The Light in the Forest (1953), by Conrad Richter. Mason & Dixon (1997) by Thomas Pynchon, includes the Lancaster Massacre. Robert J. Shade. Conestoga Winter: A Story of Border Vengeance (Forbes Road) (volume 2; 2013) includes the Lancaster Massacre. Mindy Starns Clark and Leslie Gould. The Amish Seamstress (2013); the narrator finds out quite a bit about Amish involvement in the events of the time. Brubaker, John H. (2010). Massacre of the Conestogas: On the Trail of the Paxton Boys in Lancaster County. History Press. ISBN 978-1-60949-061-4. Griffin, Patrick (2008). American Leviathan: Empire, Nation, and Revolutionary Frontier (Chapter 2). Macmillan. p. 384. ISBN 978-0-8090-2491-9. Kenny, Kevin (2009). Peaceable Kingdom Lost: The Paxton Boys and the Destruction of William Penn's Holy Experiment. Oxford University Press. p. 293. ISBN 978-0-19-533150-9. Kiernan, Ben (2007). Blood and Soil: A World History of Genocide and Extermination from Sparta to Darfur. Yale University Press. p. 724. ISBN 978-0-300-10098-3. Silver, Peter (2009). Our Savage Neighbors, How Indian War Transformed Early America. W. W. Norton & Company. p. 432. ISBN 978-0-393-33490-6. Taylor, Alan, American Colonies, New York: Viking Press, 2001. ^ McAlarney, Mathias Wilson (1890). History of the sesqui-centennial of Paxtang church: September 18, 1890. Harrisburg Publishing Company. p. 224. ^ a b Sprague, William Buell (1858). Annals of the American Pulpit: Presbyterian. 1859. Robert Carter & Brothers. pp. 77–79. ^ Brubaker, John H. (2010). Massacre of the Conestogas: On the Trail of the Paxton Boys in Lancaster County. History Press. pp. 23–24. ^ Bradsby, Henry C. (1893). History of Luzerne County, Pennsylvania. Chicago: Nelson. p. 1.567. Retrieved 23 October 2016. Egle, William Henry (1890). Glimpses of the history of old Paxtang Church. Harrisburg Publishing Company.